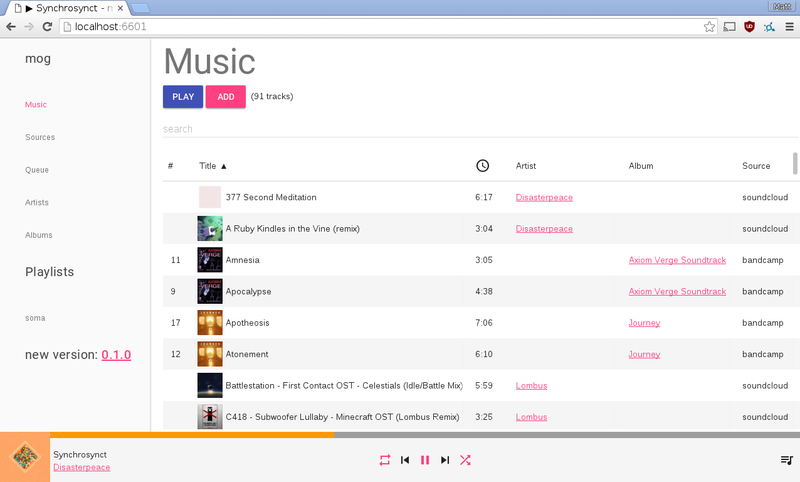 Today I am announcing the release of moggio 0.1.0. moggio is a cross-platform, multi-source music player written in Go. It runs on Windows, Linux, and Mac, can play from over a dozen sources (Google Music, Soundcloud, etc.) and from as many formats (MP3, Vorbis, etc.). Writing a cross-platform GUI application that also needed access to the sound hardware was a new problem for me, and I would like to share what I learned. A few years ago I had finished work on a side project and was looking for something interesting and useful to do. At the time (and still) I was listening to most of my music on Google Music. But I also had some one-off tunes on Soundcloud, a few albums on Bandcamp and enjoyed a regular dose of SomaFM. One of my oldest hobbies is collecting old video game music from Nintendo and Super Nintendo games. The originals come in these little (~10kB) assembly files that you can play if you have an emulator for those devices that just emulates the sound hardware. These I had to download from a Google Driver folder. I was using a Windows machine at work, Linux at home, and a Mac on the side. Each of the online music services had their own web interface. SomaFM has a web player, but can also be played with other devices. The Nintendo files required a different program on each machine. Overall I was using at least half a dozen different programs to play music on a regular basis, depending on what I was listening to and the computer I was using. What I wanted instead was a single program that could run on all of my computers, use the same interface, and play the music wherever it was. I wanted a single playlist that could have Bandcamp, Soundcloud, Google Music, and certain tracks from a Nintendo Sound File archive that lived on Google Drive or Dropbox, and could also play Shoutcast radio. More than this, I wanted to be able to use my keyboard’s media keys, or whatever else I wanted, to control all of this music listening. No more clicking into the Google Music or Soundcloud tab just to hit pause or next. Lastly I wanted this application to be in Go. All these requirements together had all kinds of hard problems, and was lots of fun to build. The biggest hurdle was, and still is, the UI. I had decided early on that I wanted to use a website as the UI instead of one of the other GUI solutions. Managing state is the hard part of this problem. The server is where all the state is kept, since it’s the thing playing the music. The UI is a view into the state of the server. Most web applications I’ve worked on before are partitioned somehow, usually by user. But in this case all views have to be the same. If someone opens up a second tab to the same server, any change performed in one tab must be immediately visible in the second. This led me to the decision that requests (like next song, pause, play a specific album, etc.) never return a result (besides success or failure). Instead, the web app is listening on a web socket to which the server broadcasts all state changes to all listening browsers. In this way all users or web browser tabs see changes at the same time. As the server is Go, having this kind of communication happening while attempting to play music without skips and blips is achievable using goroutines. But with the audio goroutine, the website handler, the data broadcaster, source fetchers (things that get song lists from the various places), there’s a lot of common data structures that need to be read and modified. I’ve played this game before using sync.Mutex locks and did not enjoy it. This time around I tried a new strategy: one main control goroutine that everything else issues commands to. All data lives in scope of only that goroutine, meaning no locks are needed. In general this solution is great. It prevented the possibility of deadlocks and guaranteed that 2 goroutines would never simultaneously access the same data. If whoever was issuing a command needed to wait for some data to be returned, it could send a results or error channel over to the command loop, which could then communicate back the result on the channel. Note you can’t use a normal function return because, say, you are doing a crawl of a Dropbox account. During the crawl the control loop still needs to respond to other data-mutating requests. When the crawl completes its results are issued in a further command, which can then return results to the caller, if needed. The two rules are don’t do any slow thing in the control goroutine and no other goroutine gets to read or write common data. This appears to be a common solution, even if not a great one. I have never once not regretted using sync.Mutex in my Go code. Every time I need a concurrent map I end up with the pass-desired-action-over-channel-send-back-result pattern. :( I put a single-use reply channel on the action object itself and feel so dirty. Decoding the audio into playable data was the other hard part. Audio decoders today are largely written and interfaced with in C. A cross-platform Go program can’t easily do that. The Go community has luckily already implemented many decoders in Go without any use of C. I wrote a Nintendo music emulator to handle that missing codec. A few others (Ogg Vorbis and Super Nintendo) have no Go implementation yet (I started on both, but they are hard). For them I found some C libraries that get compiled in when I have a C compiler handy (hence the lack of inclusion for the Windows builds of some codecs listed on the website). If someone wants a fun project to do, a Go Ogg Vorbis or AAC decoder would be a welcome contribution. After the audio files are decoded, they must be sent to the sound hardware. There’s a few options here, like using portaudio to cover all operating systems. I opted to use that just for Mac and pulseaudio for Linux user. Both of those call into a C library. Windows is the notable exception because there’s a Go library that makes syscalls directly into the sound system, meaning it can be cross compiled without a C compiler from Linux. Mog is open source on GitHub. I use it everyday to play most of my music, and it does nearly everything I need it to. It’s still got some stability issues and rough edges, but it does what it says on the box. If you’re interested in contributing, some open problems are Youtube and AAC support. I hope moggio improves how you listen to music.